We read recently former federal treasurer wax lyrical in the Sydney Morning Herald recently how the insulation 'debacle' has involved more fatalities than nuclear energy has over the same time frame. or something like that. But how would Costello know, (long term lap puppy of former PM Howard pictured above). “Dramatic declines in local infant death and childhood cancer rates occurred soon after the closing of eight nuclear power plants, according to a new report announced by New York State Assemblyman Richard Brodsky, Radiation and Public Health Project, and the STAR Foundation. The study documents a 17.4% reduction in infant mortality in the downwind counties within 40 miles two years after reactor closing, compared to a national decline of just 6.4%. Large declines occurred in all eight areas near closed reactors, and remained above national trends for at least six years after closing. The information appears as an article published in the March/April 2002 edition of Archives of Environmental Health. “We finally have reliable peer-reviewed accurate data attaching the nuclear power plants to death and injury in the host communities, this is a sobering and significant scientific study and we all need to take it seriously,” stated New York State Assemblyman Richard Brodsky. “It is critical that more studies of this type be performed, so that we fully understand the risks posed by nuclear reactors,” added Westchester County legislator Thomas Abinanti. In three of the eight areas with available data, cancer diagnosed in children less than five years of age declined 25.0% in the seven years after reactor closing, compared to a 0.3% increase nationally. Children exposed to radiation are of increased risk for cancer, says Joseph Mangano, MPH MBA, the principal author of the study who is affiliated with the New York research group Radiation and Public Health Project. We recently got permission from Brett Collins principal of Justice Action prisoner lobby/human rights group, to take a picture of this mural of Roni Levy who died from multiple gun shot wounds from police early morning about 10 years ago. Roni by all accounts was in high confusion and distress and brandishing a knife when he died. Police Minister Campbell tasers 'travel rorts' story in Sydney Morning Herald? Greens Senator Kerry Nettle said today. on research reactors like the Lucas Heights OPAL reactor. scientists gather in Australia," Senator Nettle said. action for at least six months." line for at least 6 months." reactors when they can't even run one small research reactor?" who will foot the bill." for. Will we now be required to store the world's nuclear waste? far made them hesitate before agreeing to join the club. issues fairly and squarely on the election agenda. agreement if he wins the looming election." In solidarity with his nuclear free campaigners in the USA, Benny Zable Australian peace and environmental performance artist is available for photo opportunities outside the Indian Point Nuclear Reactor during an overnight vigil 5th and 6th August Hiroshima day commemorations. Friday the core of the new nuclear reactor at Lucas Heights in Australia collapsed. US President Bush and Australian Prime Minister Howard are to sign a Global Nuclear Energy Partnership deal during the APEC meeting in Sydney. Good time to meet to talk . Dear No Nukes News subscribers, please find below a list of upcoming events including Hiroshima Day events, in Adelaide, Brisbane, Gold Coast, Melbourne, Sydney. The Prime Minister's plan to sign a nuclear pact with President Bush risks Australia's future security and environmental wellbeing, Greens Leader Bob Brown said today. "A thirty percent reallocation of current electricity supplies through energy efficiency, to meet future industrial, retail and domestic needs is a much safer, cleaner, cheaper option to dangerous nuclear power," Senator Brown said. "Mr Howard's proposed pact with President Bush will anger neighbours like Indonesia and Malaysia and foster nuclear installations in our neighbourhood. The massive radioactive leak in Tokyo Electrics' giant nuclear plant this week shows how dangerous nuclear power stations on Java could be." "The Howard move will inevitably bring Australia under pressure to become a global nuclear waste dump. It will increase terrorists' focus on Australia and will create a direct incentive for nuclear power plants to be built near our major cities, like Sydney and Melbourne," Senator Brown said. government tried to impose a nuclear facility on this state. the state from nuclear facilities are toothless. the expansion of the nuclear industry in this state. storage onto a neighbourhood in this state. 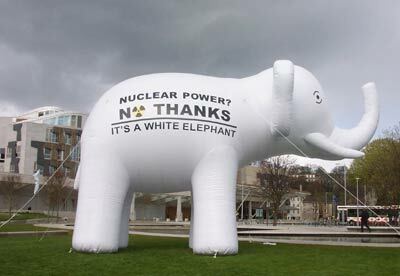 destabilisation that a nuclear industry would bring. in their back yard,” Dr Kaye said. 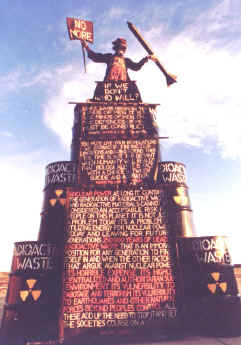 "the confrontation of good and evil"
why produce more radioactive waste products. "Fueling a new breed of Nuclear Weapons." I will also be performing in New Jersey on Hiroshima Day. energy co-operation with the United States," a briefing note says. possible 'announceable' for President Bush's visit in September." Partnership (GNEP), being championed by Mr Bush. distribution, reprocessing and storage of nuclear fuel around the world. Member nations include Russia, China, the US, Japan and France. limiting the risk of proliferation of nuclear material for weapons. nuclear waste by GNEP partners is an integral part of the arrangement. complied with the nuclear Non-Proliferation Treaty. another big supplier, have expressed interest in GNEP. Australia's membership could alarm neighbours including Indonesia. countries' radioactive waste or spent nuclear fuel." is something we would hope Australia and other countries can support." under way, focusing on safeguards and research and development. brought their concerns to the heart of Australia’s biggest city. homeland is four kilometres from the proposed Mt Everard dump site. the proposed Harts Range site. Lynch, an Arrernte woman from Central Australia.